This one proved to be the toughest watercolour I’ve ever done. I actually did a watercolour thumbnail before painting, trying to work out how much paint to put where. I still started over more often than I’ve ever done with any pic of mine, but I wanted this to be as close to perfect as I could make it, and the background was a beast to work with, because of the flame effect I wanted to achieve. I went through several attempts with different paints or paper – gouache proved too blotchy and not bright enough, while Arches paper yielded great results for bright fire but then refused to get any darker than pale purple for the figures – and returned finally to my trusty old Schmincke watercolours and Hahnemühle Veneto Torchon paper. To get there, the first stage was a bright Cadmium Yellow wash over the entire pic, mostly in a horizontal strip where their faces are. And it couldn’t be yellow enough. I found that out the hard way again with one or two earlier attempts; the second red wash swallows all the yellow. Note: The next three images were not taken of the “final” painting, but of one discarded in between because the lineart was wonky in places. That’s why there’s a slight break between “tut_oath3” and “tut_oath4”. Then, when the yellow was almost dry, I mixed Madder Red with some Burnt Sienna for the red wash. I use Madder because of its glazing qualities. It dries almost transparent even if applied rather thick. And I needed thick here. No pink this time, please. I started at the bottom and drew up the red in layers; making it almost pure water in my yellow strip and then getting redder again towards the top. Now came the trickiest part. I wanted the red to stream up in fiery streaks – blurry around the edges, but not too wet. So I had to get them in at exactly the right time, when the paint was still moist, but not wet. (When you take off very wet paint, it just flows back in, only thinner and paler). I used a dry, thick (size 12) sable mix brush to take off the paint in the shape of flames leaping up towards Fëanor. I then went in again and painted more deep reds into the spaces, to augment the effect and counteract the thinning of colour you always get when you take off paint. So I’ve arrived at this. I let this stage dry completely and then apply a dark wash that represents the dark sky. My previous approaches had lots of Indigo in it, which resulted in a rather clogged-up feel – Indigo is as opaque as watercolour gets. So this time, I opted for Ultramarine, Madder Red, and some Burnt Sienna to dull down the blue – the result was rather close to Indigo but much more transparent. Applying that wash was tricky, as I had to paint around the swords and arms. (Did I mention that masking fluid hates me and does not cooperate no matter what?) So I have some wonky bits especially on Curufin’s sword, but I’ll sort those out with the highlights. Having to paint around small details never makes for a particularly smooth look, but it was okay here. I made sure to have any irregularities running in the same direction as my flame-lines, and that worked pretty well. So, the background is finished – on to the foreground work. I start by putting a lilac wash over all the foreground figures, so assure that the underlying colour scheme in the foreground will be both consistent and shadowy. I leave some areas unshaded where the light hits. After doing this for the whole foreground, we’re left with this. Next, I tried how much more colour diversity the foreground could take. It *needed* to take some Burnt Sienna for Maedhros’ hair. Yup. Let’s go ahead and paint clothes. This still isn’t the full colouring job – the four figures on the left are still missing, and I’ll be adding another darker wash to the clothes later, too. You see me working from right to left. This is a smart thing to do if you’re left-handed. Not a smart thing to do whether you’re right-handed or left-handed are wide sleeves. At least not while you paint. These are the sort of things that make you want to thank God for Photoshop. So, barring accidents, or glowering at unshaven Curufins if accidents did indeed happen, the nearly-final image is this. The last thing that needs to be done is something I’ve never actually done before – adding gouache to a finished watercolour painting for highlights. But hey, there’s a first time for everything. I mixed white gouache with yellow and just a hint of red and set to work. My gouache palettes, incidentally, are the lids of Chipsletten crisps. I paint in highlights with a very thin brush – a 0/5, which was barely thin enough – and I’m done! Another absolutely stunning picture – it truly does the Oath justice. The background is incredibly done. 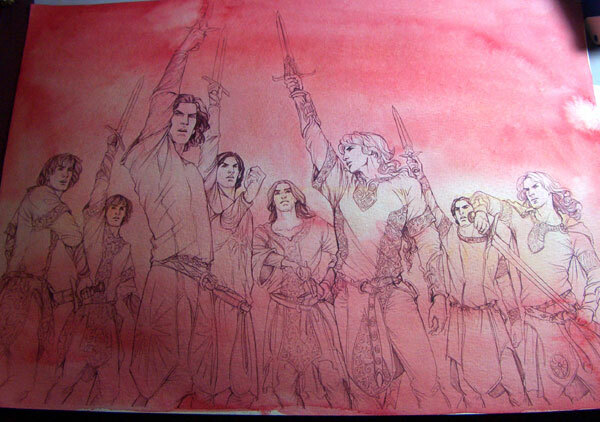 I especially love Feanor’s expression. 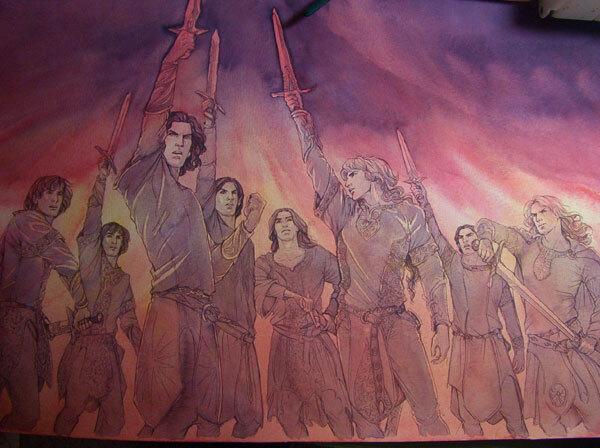 I can’t wait to see the finished piece – just looking at the picture made me go and re-read the Flight of the Noldor all over again. or something else? I don’t see how it would be different to draw on paper at any sort of a desk or flat space? Now that makes sense, thank you! Wow; just the lineart alone is so dramatic, and that sky – that’s an amazing effect you’ve created. I can’t wait to see you tackle the foreground. Always depends on the medium I suppose – were you working with watercolour? Cadmium is just the name for the hue/pigment. A gouache, oil or acrylic cadmium will be a lot less destructible. Yes, watercolour – I guess it’s just trying to learn how much water : paint to get the colour intensity without the opacity swamping everything else. From a beginner’s perspective it’s good to see how someone such as yourself uses various pigments to get the effects you do. 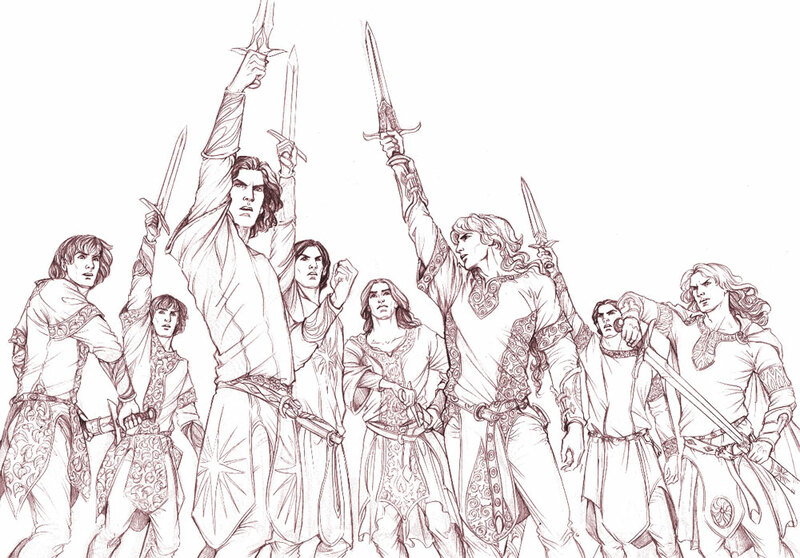 Your illustrations of the Silmarillion are legendary! Well done!!!! Das freut mich ganz besonders – danke! This is absolutely brilliant! I have been checking the page for the finished piece every couple of hours now, and I am so thrilled. 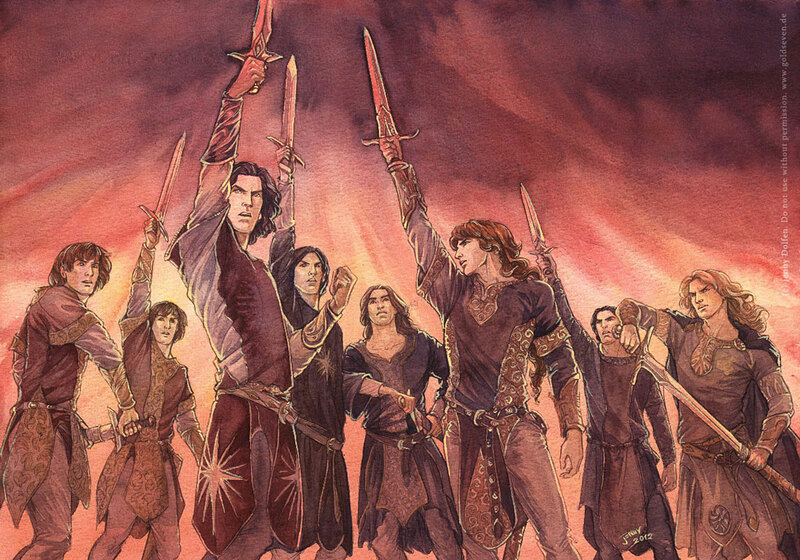 This is absolutely stunning and Feanor looks brilliant. I have always thought it would be extremely difficult to portray the “mightiest of the Noldor”, but he looks wonderful in this – I really like the shorter hair! Ouch, I didn’t know you’ve updated steps here, great! How did you fix unshaven Curufin in the end? You just used Photoshop on the scan or did fix it in the finished picture somehow? This is awesome– like another commenter says, you truly do the Oath justice. :) And thanks so much for sharing your watercolor techniques! I never realized how much work you had to do to paint this! What kind of ink do you use to print out the lineart? I think that mine might spread out when it gets wet. It only works with Epson ink – their deskjet ink is waterproof.